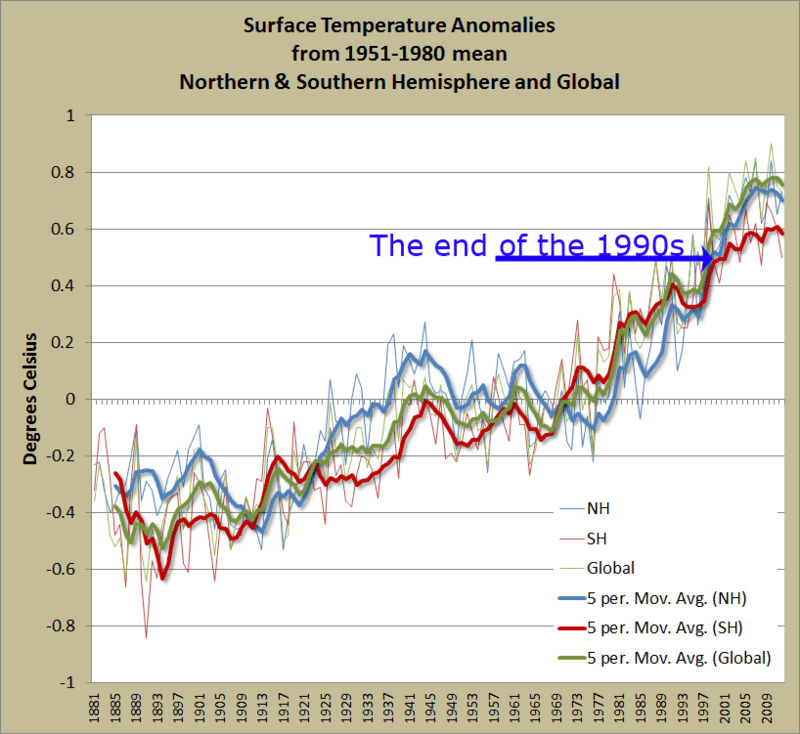 Anthony Watts has posted an article on WUWT by Joseph D’Aleo, CCM, Weatherbell Analytics who thinks that carbon dioxide doesn't obey the laws of physics. For someone who's supposed to be a trained meteorologist he displays a remarkable level of ignorance. His article is a real gish gallop with no supporting evidence or links to data to support his erroneous claims. Do all the commenters shriek loudly:- "Proof, Joe, where's your proof. Where are the links to your assertions?" like they do when someone says "the globe is warming?" Nope, not at all. Finally a couple of people protest mildly and then Steven Mosher comes in and has a go at him. I'll just pick a couple of Joseph's "wrongs". No. Joe, you can't get rid of the physical properties of a greenhouse gas quite as easily as that. You've considered one possibility, which would mean the tried and tested physical properties of greenhouse gases are 'wrong' (too silly for words) and/or that all the different data sets except one are wrong and/or that all the thermometers around the world stopped working all at the same time. I've got an idea. Wouldn't the first place you'd look be the single satellite instrumentation? It's a only a single source rather than thousands of sources. It's been badly wrong before. I can't be bothered with the rest. It's mostly a mixture of paranoid conspiracy theorising and strawmen. Making up stuff that some "alarmist" is supposed to have said so he can say - "ha, didn't happen". Typical dumb denier ranting. There's no evidence Joseph has read any of the science. He could have got all his talking points from one of those paranoid conspiracy theory denier sites like Jo Nova's. Even some of the WUWT deniers find it over the top. What's fun is that they are bending over backwards to try to explain that while they agree with Joseph that the greenhouse gas theory is wrong that doesn't mean they think that the greenhouse effect isn't real. Something to do with not wanting to be banned as "slayers" I expect. I had all his points down and was going to go through them one by one, but it became apparent that his main argument against the physics is that the thousands of scientists throughout all the world plus all the world's weather bureaus are secretly plotting together, presumably to take over the world or some such nonsense. He's probably not got the gift of evolution-denier Duane Gish, but you've gotta give him points for trying. Satellite temperature trends according to RSS. The SH is clearly warming too. (Note: the curve labelled "SH Temp" is GISTEMP SH). earths atmosphere. Above 100,000 feet MSL, the amount of atmosphere is measured in parts per million or less. Or there is not enough atmosphere above 100,000 feet MSL to create a greenhouse effect. You pick on Mr. D'Aleo without having the facts yourselves. Good luck. You will need it. Hi Terry. Welcome to HotWhopper. I'm normally fairly tolerant of people's odd beliefs however, because in this case they conflict with the subject of this blog (science), I figure you've lost your way. We are not tolerant of anti-science evangelists here. Try a climate conspiracy blog where you are more likely to find like minds. What was that meme? Rule one of Dunning Kruger Club - you do not know you are in Dunning Kruger Club. Or there is not enough atmosphere above 100,000 feet MSL to create a greenhouse effect. You pick on Mr. D'Aleo without having the facts yourselves. Good luck. You will need it. The GHE operates by elevating the altitude of effective emissionat the so-called 'top of atmosphere' (TOA). Right where you claim it could not operate at all. I suggest further reading. "The GHE operates by elevating the altitude of effective emission at the so called "top of the atmosphere" (TOA). TOA is the non sequitur. There is no top of the atmosphere. The atmosphere continually changes with reduced density going upward; much less so above 100,000 feet MSL. The atmosphere is still present in minute parts per million quantities or less up to and beyond several hundred miles above earth. Try reading and using some weather or meteorology terms; the most knowledgeable people on this subject. Creating your own terms will only get you scorn. In parts per million or less, supposed greenhouse gases can not provide or create a greenhouse effect; it takes lots of supposed greenhouse gas molecules, lots of them, to create a greenhouse effect; and still air is also a necessity; does not exist anywhere in the atmosphere. Your denial of these plain sense weather and atmospheric facts is very foolish. I look forward to your sources. If you have any, they are likely as non scientific as your erroneous explanations. The best advice here appears to be: grow up, get a good scientific education and a job. No trained person I know will fall for your gobble de goop. Terry, I've already told you that pseudo-science crankery is not welcome here. Last warning, and some reading to keep you occupied while you look for a climate conspiracy home. "TOA top of the atmosphere"
One will get upwards of 20,000 results - most of which are articles in the AMS Bulletin or Journal of the AMS. It seems our Terry is D-K afflicted. I went to every location at this blog; nothing credible. constantly changing; why there is not one; no such thing as an atmospheric TOA. eruptions and related and all plasma inputs to Earth's magnetic and electric fields; put together with in coming and out going solar energy in watts and or btu; so everyone with an advanced math education can see where the heat is going and coming from. I urge you take at least one thermodynamics course; preferably two and at least two geologic courses on volcano outputs, and related; and a physics course on the sun's plasma contacting Earth's magnetic and electric fields. Then we may have some kind of answer instead of the crap you have been spreading. TOA appears to be an invention of the latest non scientists sometime in the last 20 years. That's the sound of science denial and conspiracist ideation. And of you retreating from rational discussion beneath a voluminous tinfoil hat. You are not in a position to do any urging, TDW. Your silliness about TOA and ignorance of how the GHE actually works is evidence that you are the clueless party here. is what is real or actual. Why your sources may have some validity; but most certainly appear to be crap. Yes Terry, it's all crap. Warming post-1950 is in fact caused by caramelised onions in the stratosphere. Only raw data is real?!!! That is about the stupidest statement I have ever seen. Something tells me you have never in your life collected raw data. Feynman would rip you to shreds were he still around. Getting good, stable, reliable, and valid raw data is very hard. That why professionals spend so much of their time working on ways and means to collect and collate it. If only raw data was real, we'd be using the microwave emissions numbers directly from the AMSU satellites instead of the reinterpretated, adjusted, averaged, and anomalized obviously-invented "temperature" nonsense from Roy Spenser and John Christy at UAH. Right? I mean, their over-manipulated made-up and infilled numbers are clearly useless, and about as far from "raw data" as it is possible to get. What Terry D Welander is saying is that NASA, the US National Weather Service and the American Meteorological Society are "crap". (What's left? Or what sources are there that don't have similar findings? Any secondary/tertiary/quaternary and so on sources that deniers fabricate or use are derived from primary sources like the NWS. I only left his comment because it demonstrates even better what weirdness abounds on the internet. Plus it's got replies. Sou, that is what it comes down to. When logic and reason and data all fail, the only final recourse is to deny the data. If there is no data, then there can be nothing at all. Its not really getting hotter: its just that every organism on this planet, and every scientific instrument, is getting more sensitive to heat. It's a given that the DK crowd will eventually invoke Richard Feynman, although it's pretty obvious that few have bothered to crack open, much less comprehend, The Feynman Lectures On Physics. In the 1950s, before the DK effect was identified, Martin Gardner referred to it as "peevish ignorance" which "betrays no understanding of the views opposed, although the authors have had every opportunity to avail themselves of such knowledge". Terry D Welander, before you start telling Sou to follow any courses only tangentially relevant to climate science, maybe you could start with actually following a course on climate science. David Archer organizes a good online course, and it goes slow enough for someone with just an engineering background (like you) to understand the basic concepts. That is, if you even *want* to learn the basics. So far your insistence on someone following a course on plasma physics to understand climate is...well...just weird. Volcanism can be nice to understand some past climate changes, but for the present it is just a very minor issue. After warnings, Terry persists. His latest comment isn't lost forever. It has been relegated to the HotWhoppery, where he can mull over the role of the FBI and the FCC.